From October 2016 to September 2017, 40 pediatric patients with displaced diaphyseal forearm fracture were treated with titanium elastic nail system. The following criteria were followed while selecting participants. With proximal and distal radioulnar joint disruption. A patient was put in the supine position on operating table with the affected arm placed on a radiolucent arm table. Titanium elastic nails of appropriate diameter were chosen. The nail diameters were about two-thirds of the medullary isthmus of each bone. Then, the awl was used to make entry point in the bones. Entry point in the radius was either just proximal to the radial styloid or through Lister's tubercle. The antegrade entry point in the ulna can be either at the posterior aspect of the olecranon or a lateral approach through the proximal metaphysis. The retrograde entry point in the ulna was through the distal metaphysis. Because the radius is often more difficult to reduce, it should be splinted first. Radial nail was inserted manually with the inserter for TEN into the medullary canal, with the nail tip at right angles to the bone shaft. Then, the nail was rotated through 180° with the inserter, and the nail tip was aligned with the axis of the medullary canal. The nail was advanced up to the fracture site with oscillating movements. The radial nail tip was aligned with the medullary canal of the proximal fragment. Then, the nail was advanced with smooth oscillating movements until the tip reaches the proximal fragment metaphysis. Ulna nail was then introduced and progressed in similar manner such as radius nail. When the nails were correctly positioned in the opposite metaphysis, protruding nail ends are cut approximately 1 cm from the bone. In most of our cases, closed reduction was done. In few cases, where closed reduction could not be achieved, mini-incision was given over fracture site for the reduction of fracture and internal fixation with titanium elastic nail done. Postoperatively, majority of the patients required no external immobilization. However, in some patients, plaster of Paris slab was given for 2 weeks to encourage soft-tissue healing. Patients were followed up at 4, 8, 12, and 24 weeks. Early range of exercises was started, and results were evaluated as per Price et al. [Table 1] criteria taking pain and range of motion of forearm (supination/pronation) into consideration. All the fractures united at an average 10–12 weeks without any malunion [Figure 1], [Figure 2], [Figure 3], [Figure 4], [Figure 5], [Figure 6]. 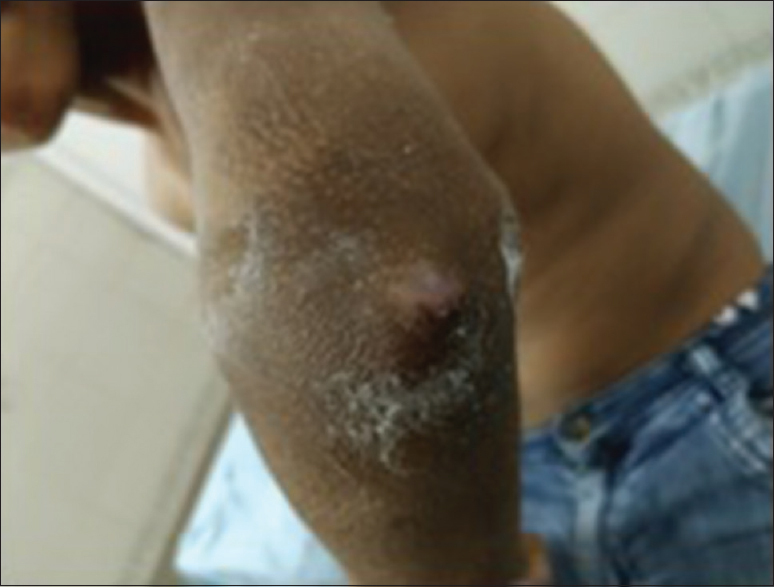 Two patients had superficial infection and three patients had pain due to nail prominence [Figure 7]. Five patients had restriction of supination and Pronation [Figure 8]. Elbow flexion and extension, palmar flexion, and dorsiflexion at wrist were normal. As per Price et al. criteria, 87.5% (35) of patients showed excellent results, 10% (4) showed good results, and 2.5% (1) showed fair result. In our study, out of 40 patients, fractures involved proximal third of shaft of forearm bones in 15 (37.5%), fracture middle third in 19 (47.5%), and distal third involved in 6 (15%) patients [Table 2]. Closed reduction and internal fixation with titanium elastic nail system was achieved in 37 patients (92.5%) under image intensifier guidance. In three patients, closed reduction failed, so mini-incision was given over fracture site and internal fixation with titanium elastic nail system done [Table 3]. In a study by Kapila et al., out of 50 cases, closed reduction and intramedullary fixation in 47 patients (94%) under image intensifier guidance and 3 (6%) patients required open reduction and intramedullary fixation. Mean radiological union in our series was 10.2 weeks. A study conducted by Ali et al. and Parajuli et al. also had radiological union at 10 weeks., On our final follow-up, 35 patients had loss of movement at forearm by <15°, 4 patients had loss of movement at forearm by 15°–30°, and 1 patient had loss of movement at forearm by 50° [Table 4]. A study conducted by Kapoor et al. found restriction of movement of the forearm in 9 (18%) out of 50 patients. A study conducted by Mohammed et al. found good functional outcome in 19 out of 21 patients. Two patients in our study had superficial infection which was subsided by dressing and intake of antibiotics. Three out of our forty patients had pain due to nail prominence. The study conducted by Ali et al. and Parajuli et al. also faced complications such as superficial infections and prominence., We did early implant removal after bony union. Meantime of implant removal was 8.2 months (range: 6–12 months). Although the fracture of both bones of the forearm in children can be managed conservatively, they often lead to malunion with restriction of movements at either elbow or wrist joint. In comparison to conservative method, titanium elastic nail system showed excellent results in terms of bony union, functional outcome with minimal complications, and cosmesis. Therefore, this minimally invasive method of TENS may be considered as an attractive and effective alternative for displaced forearm fractures in pediatric age group. Flynn JM, Waters PM, Skaggs DL. Rockwood and Wilkins Fractures in Children. 8th ed. Philadelphia: Wolters Kluwer; 2015. p. 413-72. Metaizeau JP, Ligier JN. Surgical treatment of fractures of long bones in children: Interference between osteosynthesis and physiological process of consolidations: Therapeuticindications. J Chir (Paris) 1984;121:527-37. Johnson CW, Carmichael KD, Morris RP, Gilmer B. Biomechanical study of flexible intramedullary nails. J Pediatr Orthop 2009;29:44-8. Dietz HG, Schmittenbecher P, Illing P. Intramedullare Osteosynthese Imwachstumsalter. Munchen: Urban and Schwarzenberg; 1997. Bellemans M, Lamoureux J. Indications for immediate percutaneous intramedullary nailing of complete diaphyseal forearm shaft fractures in children. Acta Orthop Belg 1995;61 Suppl 1:169-72. Griffet J, el Hayek T, Baby M. Intramedullary nailing of forearm fractures in children. J Pediatr Orthop B 1999;8:88-9. Kapila R, Sharma R, Chugh A, Goyal M. Evaluation of clinical outcomes of management of paediatric bone forearm fractures using titanium elastic nailing system: A prospective study of 50 cases. J Clin Diagn Res 2016;10:RC12-5. Ali AM, Abdelaziz M, El-Lakanney MR. Intramedullary nailing for diaphyseal forearm fractures in children after failed conservative treatment. J Orthop Surg (Hong Kong) 2010;18:328-31. Parajuli NP, Shrestha D, Dhoju D, Dhakal GR, Shrestha R, Sharma V. Intramedullary nailing for paediatric diaphyseal forearm bone fracture. Kathmandu Univ Med J (KUMJ) 2011;9:198-202. Kapoor V, Theruvil B, Edwards SE, Taylor GR, Clarke NM, Uglow MG, et al. 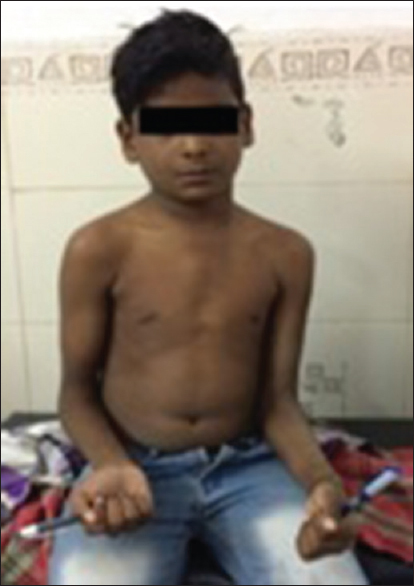 Flexible intramedullary nailing of displaced diaphyseal forearm fractures in children. Injury 2005;36:1221-5. Mohammed H, Salloom F, Albagali M, Aljahromy I. Flexible intramedullary fixation of paediatric forearm fractures – Report on twenty-one patients. Bahrain Med Bull 2009;31:13-6.